The former Scottish first minister thinks it’s only a matter of time before there’s another Scottish independence referendum. ALEX SALMOND SEES a lot of similarities with Ireland’s push for Home Rule nearly 100 years ago and Scotland’s inevitable – in his view – march towards independence. The former Scottish first minister may have failed to convince the voters last year, but as far as he’s concerned the question of another independence referendum is not if, but when. “I think we’re heading on the right road,” he told TheJournal.ie in a revealing interview this week. We’re going to get there, I think, within a reasonably defined timescale and, as far as I am concerned, the sooner the better. Support for independence has grown since the No vote with Salmond saying the most recent polls put it at 49%, which is ”still in the minority but heading in the right direction”, according to the ex-SNP leader. Salmond’s successor Nicola Sturgeon has also overseen a remarkable surge in support for the SNP which, aided by its strong anti-austerity message, saw it sweep the boards in May’s Westminster elections, winning 56 of the 59 seats in Scotland and wiping out Labour in the process. The forthcoming UK referendum on EU membership will be crucial to the push for another independence referendum. Sturgeon has already said that if Scotland voted to stay in the EU, while the rest of the UK voted out, it would provide the circumstances for another independence vote. If Scotland voted ‘In’ by perhaps 2-to-1… but we’re dragged out on the back of English votes because England is 10 times bigger than Scotland then that would provoke a constitutional crisis which I think would have to be resolved by a second independence referendum. He would not be drawn on when this would have to happen but said it would be “a very defined timescale”. The increasing level of support for independence has much to do with the UK government having failed to deliver on ‘The Vow’ – a last-ditch pre-referendum commitment to devolve more powers to Scotland. Email “Alex Salmond told us why another independence referendum is inevitable”. 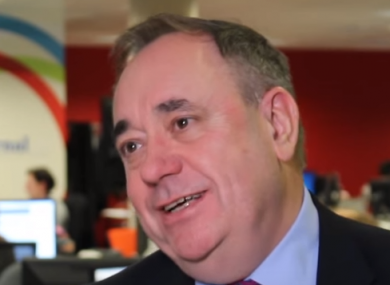 Feedback on “Alex Salmond told us why another independence referendum is inevitable”.